We are back with another RoyalCaribbeanBlog Video today, and we are letting you in on the cruise line jargon that you might hear or read while planning a Royal Caribbean cruise. In the cruise industry, there is a lot of words and phrases thrown around that have roots in the sailing industry as well as on cruise ships. We have a breakdown of the most important words you should know prior to going on a cruise so that you know exactly what people are talking about. When you decide to book a Royal Caribbean cruise, you have to decide between a refundable cruise fare or a non-refundable cruise fare. The decision to opt for one or the other largely has to do with your risk tolerance, personal preferences and how you vacation. Here is a quick breakdown of what to consider before booking a cruise. What is a refundable cruise fare? A refundable cruise fare is a booking made in which if the sailing is canceled prior to the final payment date, Royal Caribbean will issue a full refund of any deposit/money paid towards that reservation. Historically, refundable cruise fares were the norm and they offer greater flexibility especially if vacation plans are not firm. Booking a cruise vacation months or years in advance can be difficult when trying to account for time off of work and other personal responsibilities. Provided the reservation is before final payment date, refundable cruise fares are eligible for repricing, as well as changing to a different sail date or ship without penalty. What is a non-refundable cruise fare? Non-refundable cruise fares are bookings for a Royal Caribbean cruise in which if the guest opts to cancel a non-refundable booking prior to the final payment due date, Royal Caribbean will issue a future cruise credit in the amount of the deposit paid minus a $100USD per person service fee to the guest named on the canceled booking. Such Future Cruise Certificates can be applied towards your future. The reason to book a non-refundable cruise fare is because the price is lower than a refundable cruise fare and they have become popular with cruisers who are interested in the lowest possible price for their cruise vacation. Change fees are only incurred should an adjustment to the ship and/or sail date occur; therefore, no change fee will be assessed upon swapping between category types on the same ship and sail date (such as in the case of a price drop). It is worth noting you can change from refundable to non-refundable fare at any time (but not back). Price: We would be remiss if we ignored the most compelling reason to book a non-refundable cruise fare and that is the price. Often non-refundable cruise fares are hundreds of dollars cheaper than refundable cruise fare. Multiplied by many people in a group and the savings can be substantial. Flexibility: How flexible do you need to be with your sail date? Are you dead set on the sailing and ship you are on? Or is this a placeholder reservation that you are not too certain you will sail on? These sort of questions are at the heart of deciding between a refundable and non-refundable fare. The more doubt you have about your plans, the less compelling a choice non-refundable cruise fare becomes. Stateroom type: If you are staying in an upper suite, the decision has been made for you. Royal Caribbean made the change to enforce only non-refundable fare options for its suite inventory. This also holds true for guarantee categories, including W/WS, X/XB, XN, Y/YO, and Z/ZI. Still unsure which to pick? When in doubt, go for refundable cruise fare for the flexibility it provides. It may cost more money, but if you are still "on the fence" about your plans, the knowledge of being able to cancel and get a full refund before final payment date is a great choice to have. Moreover, we recommend talking over the decision with a good travel agent. Travel agents are a wealth of knowledge and have seen pretty much every booking scenario (and nightmare) you could imagine. Their years of experience can be invaluable in choosing the right cruise fare and the best part is their services and consultation should cost you absolutely nothing extra. Which cruise fare do you typically book? Do you still have a question about cruise fares? Let us know in the comments below! Many first-time cruisers are curious how much a Royal Caribbean cruise will cost. While your cruise fare includes most onboard activities and meals, there are government fees, excursions, spa treatments, drinks and more to consider. To help budget and give you a ballpark idea of what to expect cost-wise, you should be aware of the possible areas where costs exist. No one can accurately predict exactly the cost of a Royal Caribbean cruise in total, because the total vacation cost will depend on your preferences and what choices you make in the course of your trip. To help you get a better idea of what you might actually spend on a cruise vacation, we compiled a list of the major factors that influence the total cost to figure out the total cost of your cruise before you book. The largest chunk of calculating how much a cruise costs begins with the base cruise fare. This is the cost Royal Caribbean charges you to get a stateroom onboard a ship, and that includes a lot of amenities. Your base cruise fare will depend on a variety of factors, including the ship you choose, length of your sailing and which category stateroom you pick. You could pay hundreds or thousands of dollars per person, but it really depends on what you choose or prefer. A good travel agent can help you price out the cruise fare options get you started. To help get a lower price on the cruise fare, be sure to try one of these strategies for finding the best deal on a Royal Caribbean cruise. After the cruise fare, it is important to figure out your means of getting to and from the cruise ship. Quite a lot of cruisers end up flying to their embarkation ports, but Royal Caribbean may offer a cruise that is close enough to your hometown that you can drive there. In conjunction with booking your cruise fare, it is a good idea to price out transportation costs and see how much this will run you. Like the cruise fare, this is a required cost and something that can drive up the total cost of your cruise vacation substantially. Be sure to also include the cost of a rental car, shared ride service or airport transfers into your calculations. We are not experts on finding the lowest airfare prices, but you should try a few airfare tips and tricks to bring down the cost. Another built-in cost of the cruise is the daily gratuity that Royal Caribbean will charge each guest. There are two types of gratuity on Royal Caribbean: an automatic gratuity and optional ones. The automatic service gratuity is $14.50 USD per person, per day for guests in Junior Suites and below, or $17.50 USD per person, per day for guests in Grand Suites and above, applied to each guest’s SeaPass account on a daily basis. The gratuity applies to individual guests of all ages and stateroom categories. Guests can pre-pay gratuities by calling 866-562-7625 or logging into www.royalcaribbean.com at least 48 hours prior to sailing. For guests booked through a travel agent, your agent can add pre-paid gratuities to the booking at least 48 hours prior to sailing. If gratuities are not prepaid prior to sailing, they will be automatically added to the folios once onboard. A 18% gratuity is automatically added to all beverages, mini bar items, and spa & salon purchases. An area of the vacation that can add up quickly are beverages. Royal Caribbean includes some beverages with your cruise vacation, but inevitably a lot of guests opt to indulge and order beverages such as beer, cocktails, wine or soft drinks. You have the option of purchasing beverages one at a time, and can consult our list of Royal Caribbean drink prices for an idea of what to expect to pay. Certainly if you are not much of a drinker, going this route will be satisfactory. If you think you might drink more than a couple drinks per day, perhaps consider investing in an unlimited drink package. Royal Caribbean offers these beverage packages as a means to offer a simple, yet simple approach to drinking onboard. If you are wondering if a Royal Caribbean drink package is worth it, it ultimately depends on you and if you can drink enough every day of your cruise to make it worthwhile. Besides alcohol, coffee and tea is another factor in your beverage budget. Royal Caribbean does include complimentary coffee and tea, but if you prefer lattes, espresso, macchiatos or other specialty coffee drinks, those will come with an additional cost. Just like alcoholic beverages, you can opt to purchase them individually or opt for a beverage package. One last note about beverages is you can cut down on the cost of your drinks by opting to drink in the ports your cruise will visit. Depending on your itinerary, this may or may not be a good alternative to paying Royal Caribbean's drink prices. There is no shortage of complimentary food on your Royal Caribbean cruise and you can easily go your entire cruise without paying a dime extra for food and be quite content. However, Royal Caribbean does offer some additional dining options that carry an additional cost to them. Specialty dining costs can come in the form of cover charges (pay one fee and get all the food included) or a la carte charges (pay for only what you order). In general, specialty dining offers food and cooking styles not available elsewhere on the ship for guests that choose to indulge in them. Specialty dining is an option for guests who want something more than what is offered in the complimentary dining, with an emphasis on certain foods that are otherwise unavailable all the time. Think of specialty dining like you would going out for dinner versus staying home and cooking something. You would be perfectly content with a home-cooked meal, but going out for dinner is a nice treat that comes with a higher cost. You can preview the cost of specialty dining, as well as consider a specialty dining package, by going to the Cruise Planner site on Royal Caribbean's website. Check out our restaurant reviews for an idea of what each restaurant offers. 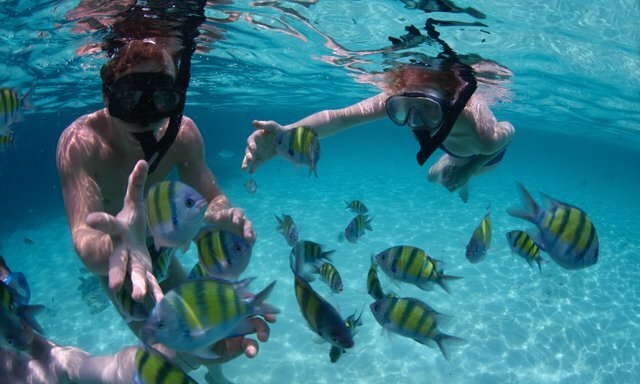 Inevitably, shore excursions are something everyone typically opts for on a cruise vacation. These are the activities offered in the various ports of call that your cruise ship will visit. You could do something simple like taking a taxi downtown and walking around, take a walking tour or even a bus ride around town. Or hop in a helicopter, ride a dog sled or visit historical sites. In short, there are lots of options when visiting any port Royal Caribbean will take you. Picking the perfect shore excursion will depend on what you are looking to do, but you have the choice of booking a tour through Royal Caribbean or going on your own and working with a third-party vendor. The cost of shore excursions can be just as varied as your cruise fare. Having internet access on your cruise went from something nice to have, to a near necessity these days. Royal Caribbean's onboard WiFi comes in two options: an unlimited plan or 24 hour access packages. Royal Caribbean calls its internet service, Voom, and it boasts excellent speeds onboard its ships. Unlimited internet plans are available for purchase before or during your cruise. Almost always, the cost of an internet package is cheaper before the cruise thanks to pre-cruise discounts. During your cruise, Royal Caribbean's photographers will snap shots of you and your family that you have the choice to purchase later in the sailing. While far from a neccesity, onboard photos represent for many families an opportunity to take professional shots and remember a fun family vacation. Royal Caribbean offers photos priced individually, as well as photo packages. Just like the drink packages, which option to take depends on how much you will take advantage of the photo opportunities. Admittedly, it is quite difficult to exactly estimate how many photos you will want to take, but keep in mind that it is part of the cost of a cruise. You can always take your own photos during the vacation, but the photo opportunities Royal Caribbean offers make for some very compelling memories. The total cost will vary depending on your preferences. If you add up the numbers from the spending categories outlined in this post, you should have a ballpark idea of what your Royal Caribbean cruise cost. How much a Royal Caribbean costs depends so much on the choices you make before and during the cruise. Many of the extra costs are optional, but then again you are on vacation and indulging is what makes vacation so fun. Hopefully this will give you a guide on what to expect and ultimately, you have the power to determine how much higher the cost will be in the end! Read more about How much does a cruise cost? Royal Caribbean has big plans for 2019, with plenty of new additions and changes to the fleet. Perhaps no change is bigger than the anticipated arrival of a new cruise ship and refurbishment of quite a few others. Each year, Royal Caribbean plans on changes to its fleet of ships and if you are considering a 2019 cruise, then you are certainly going to want to consider some of these ships that are getting new upgrades or are joining the fleet for the first time. Here is what you need to know about the cruise ships joining Royal Caribbean's fleet and which ships will be upgraded this year. Royal Caribbean will add one new ship in 2019 to its fleet, which will be the first subclass of an existing class. The first Quantum Ultra Class ship joins Royal Caribbean's fleet in 2019 with the launch of Spectrum of the Seas. Spectrum of the Seas is the first Quantum Ultra Class vessel. What separates Spectrum from previous Quantum Class vessels is the fact she will boast private enclave for suite guests, new stateroom categories, innovative dining concepts, and stunning features and experiences – many of which have never before been seen at sea. 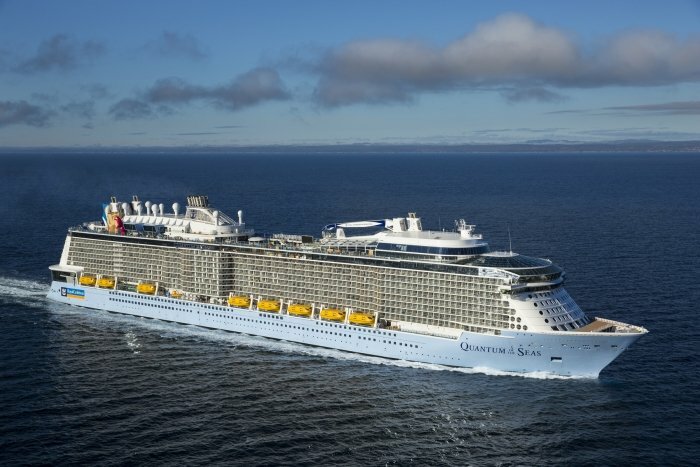 Accommodating 4,246 guests at double occupancy and 1,551 international crew members, Spectrum will be the largest and most expensive ship in Asia when she sails from Shanghai starting in June 2019. Spectrum will debut Royal Caribbean’s first exclusive suites-only area, which will feature the exquisite Golden and Silver suite accommodations in a private enclave at the forward end of the ship on decks 13 through 16. Vacationers booked in these luxury suites will have special keycard access, a private elevator and a dedicated restaurant and lounge. In addition to a range of exclusive amenities, guests will have access to The Balcony – a private outdoor space for sunbathing and relaxing – that offers the best views on board; and The Boutique, a shopping area where travelers can book private shopping experiences. Another big change for Spectrum is the ship's take on dining, The three-level main dining room will serve a variety of Chinese and Western a la carte options rotating each day of the sailing. The Windjammer Marketplace – 20 percent larger than those on Quantum Class ships – will offer a wide buffet selection of Chinese and Western dishes, including noodles, pizza, Japanese teppanyaki and mini hot pot. Spectrum will boast a number of specialty restaurants, including Wonderland’s Dadong (run by Chinese chef Dong Zhenxiang), Jamie's Italian, Izumi, Chops Grille and the new Leaf and Bean traditional tea room and café parlor. 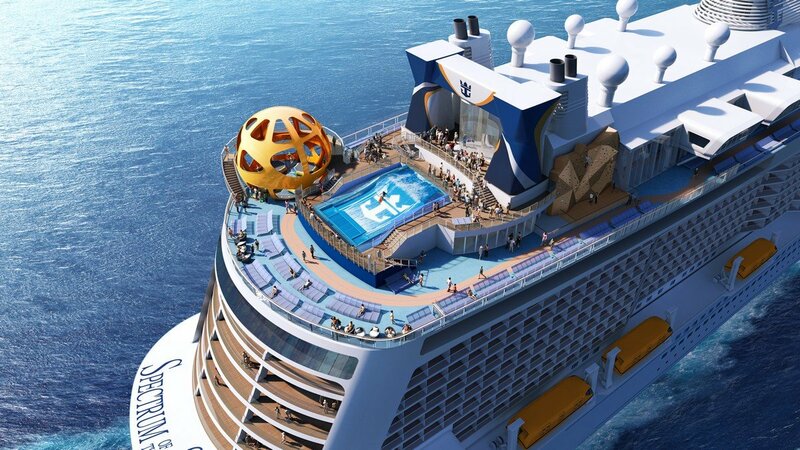 Spectrum of the Seas will feature bold and unexpected experiences, including the iconic Sky Pad, a virtual reality, bungee trampoline experience located on the aft of the ship. Royal Caribbean is always looking to add more value to their ships and in 2019, four Royal Caribbean ships are getting upgrades, refurbishments and some nice changes. Here is a list of what you can expect to see changed in the coming year. Royal Caribbean will start 2019 with a major refurbishment of Navigator of the Seas. Navigator will undergo a $115 million upgrade, as part of the fleet's Royal Amplified program. Royal Caribbean will add all-new features and firsts, including a revamped Caribbean poolscape, two waterslides, the first blow dry bar at sea, nightlife and dining, and activities for the whole family. Navigator of the Seas will return to service on February 24, 2019 and offering 3- and 4-night Caribbean cruises from Miami. Empress of the Seas will undergo a dry dock for maintenance work in February 2019. There are no sailings scheduled between February 3, 2019 and March 3, 2019. No word on what work will be done, but it is expected to be mostly a maintenance effort to keep the ship running in great condition. Like Navigator of the Seas, Voyager of the Seas will also undergo a refurbishment in 2019 as part of the Royal Amplified program. Royal Caribbean has not announced the exact changes that are coming to Voyager of the Seas, although it stands to reason the changes should be similar to recent changes made to Mariner of the Seas or the scheduled changes for Navigator of the Seas. The Royal Amplified program continues with upgrades coming to Oasis of the Seas. Just like Voyager of the Seas, Royal Caribbean has not announced any specific details on what will be changed on Oasis quite yet. Oasis of the Seas will undergo the refurbishment work after wrapping up her summer cruise season in Europe. Following the bow-to-stern revitalization, Oasis of the Seas will change her homeport to Terminal A at PortMiami for the fall and winter seasons. Royal Caribbean describes the goal of the Royal Amplified program as something that will, "innovative attractions, pools, bars, and dining." Royal Amplified targets three key areas: pool deck & attractions, bars & nightlife, and onboard dining. Prior to Quantum of the Seas' six month homeport in Singapore, she will be revitalised in a multi-million dollar project that will see the ship refreshed and upgraded. If you are wondering what work will be done on Quantum of the Seas, so are we. Royal Caribbean has not announced yet the scope of changes coming to Quantum of the Seas. Which ship addition or refurbishment are you most excited about? Tell us in the comments! With 2019 right around the corner, a new year of Royal Caribbean cruising is nearly upon us. With the new year comes new changes to Royal Caribbean, and we picked out six of the most noticeable changes that guests will undoubtedly encounter. While Royal Caribbean's new smart phone app has been around since being announced in 2017, 2019 will be the biggest year yet for the app. In 2019, Royal Caribbean's app will not only roll out to most (if not all) of the fleet by years' end, it will also see the most popular features finally reach users. Scheduled for a 2019 rollout are features such as chat, shore excursions, stateroom dining and even stateroom changes. In early 2019, Navigator of the Seas will undergo a major upgrade effort that will see a lot of great new features added to the ship. Navigator is set to receive a combination of firsts as well as Royal Caribbean favorites, including an awe-inspiring Caribbean poolscape, waterslides, the first blow dry bar at sea, nightlife and dining, and thrilling activities for the whole family. Navigator of the Seas will be the third Royal Caribbean ship to undergo a Royal Amplified upgrade. Royal Amplified is a $900 million initiative to reimagine Royal Caribbean's fleet through a new modernization effort. Royal Caribbean will debut a Quantum Class ship in Alaska in 2019, with the arrival of Ovation of the Seas for the 2019 Alaska summer season. Ovation of the Seas will transition from Sydney, Australia to her new summer homeport of Seattle, Washington. Ovation will sail 7-night itineraries to destinations from Juneau to Victoria, British Columbia, showcasing Alaska’s natural treasures and luring adventure seekers with stately spruce forests, island- studded waters, native wildlife and awe-inspiring glaciers. In 2019, Royal Caribbean's $200 million upgrade to its private island in the Bahamas will open its first phases to the public. Along with a new pier, a number of new attractions and experiences at Perfect Day at CocoCay will debut in 2019. Guests will be able to choose from a variety of fun ways to spend their day, in addition to the classic lounging by the beach option. Royal Caribbean lists Thrill Waterpark, the Zip Line, Splashaway Bay aqua park, Up, Up and Away helium balloon, Captain Jack’s Galleon, Skipper’s Grill dining, Captain Jack’s dining, Chill Island, Chill Grill dining, and Oasis Lagoon freshwater pool will open in May 2019. South Beach, Coco Beach Club and the overwater cabanas are scheduled to open in December 2019. File this change as something to keep track of for later, because we do not know the full extent of what will be done quite yet, but Oasis of the Seas is headed to Europe in 2019 and her season across the pond will culminate with a major upgrade. For the first time since 2014, Oasis of the Seas will spend the summer season in Europe when the ship repositions to Barcelona in 2019. From Barcelona, Oasis of the Seas will sail seven-night itineraries, visiting Palma de Mallorca, Spain; Marseille, France; and Florence (though the port wasn't specified), Civitavecchia and Naples, Italy. Following her European season, Oasis of the Seas will undergo a bow-to-stern revitalization before changing her homeport to Terminal A at PortMiami for the fall and winter 2019 seasons. 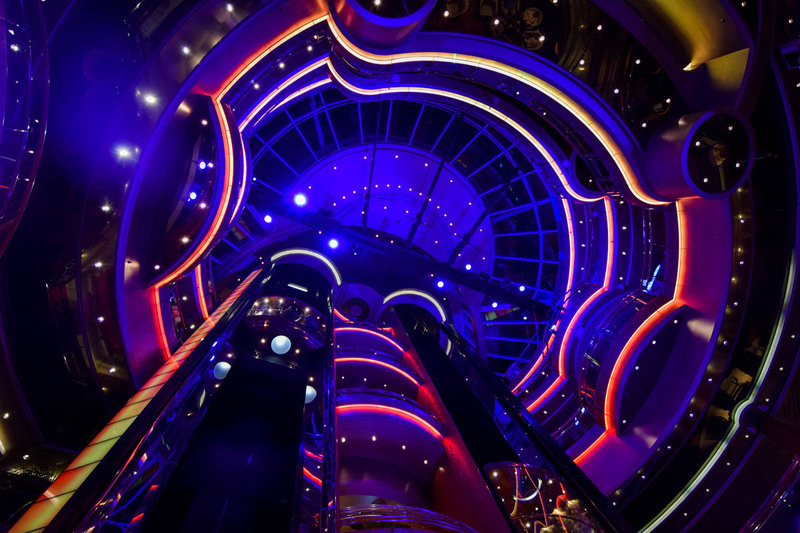 If you are wondering what changes Oasis of the Seas will receive, well, so are we. Royal Caribbean has not divulged what will be changed or added to Oasis of the Seas quite yet. The new year will see a new Royal Caribbean ship join the fleet with the addition of Spectrum of the Seas. Spectrum of the Seas will be the cruise line's first Quantum Ultra class ship. The ship will feature a number of firsts for a Royal Caribbean ship, including the cruise line’s first private enclave for suite guests, new stateroom categories, "innovative dining concepts", and "stunning features and experiences". Designed specifically for the Chinese market, Spectrum of the Seas will be the largest and most expensive ship in Asia when she sails from Shanghai, China starting in June 2019. The ship is scheduled to be delivered in April 2019. Which Royal Caribbean change are you most excited about for 2019? Tell us in the comments!